With all the necessary components mounted and displayed on a wooden board, this 1923 Atwater Kent breadboard radio appealed to the curious consumer fascinated by new technology. A harbinger of both technological and social advancements, the advent of the radio drastically changed Philadelphians’ means of communication and connection to communities beyond their front stoop. Founded by A. Atwater Kent (1873-1949), the Atwater Kent Manufacturing Company operated in Philadelphia from 1902 to 1936. In order to keep up with ever-evolving machinery, Atwater Kent introduced seven different “breadboard” radio models in 1923 alone. This radio, Model 4052, was the fourth installment. A breadboard radio, so named for its wooden cutting board-like base, lacks any form of external casing. All of the hardware required to power the radio, receive radio signals, and amplify those signals is installed on top of the wooden board. The tuning dial sits at the far left with the Radio Frequency (RF) Amplifier directly next to it. To operate this radio, a user would need to connect an antenna to the tuner to attract the radio signals, which would filter through the RF Amplifier to be converted to a higher power signal. The potentiometer and transformer sitting to the right of the RF Amplifier fine-tuned the radio signal to make it suitable for home use. These elements were all wired together underneath the board, so they were very easy to assemble. Designed to be simple and utilitarian, the breadboard radio layout kept prices low and parts easily replaceable. Unlike most other modern appliances, this breadboard radio could not simply be plugged into the wall (the first 110-volt electric radio was not invented until 1926). All of the early Atwater Kent models ran on batteries that connected to the wiring beneath the board. These batteries were large, heavy, and messy—they often leaked acid right on to the living room floor. In addition to leaking acid, the batteries did not hold a charge for very long, so families would keep two sets to swap out a freshly charged pair when necessary. Once thoroughly charged, the Model 4052 radio had enough battery power to drive a horn or cone speaker. It connected directly to the amplifier, the piece on the right end of the board with the three tubes on top. Earlier models could only connect to headphones for one person to listen at a time, but with the horn and cone speakers, whole families could listen to radio programs, news broadcasts, or music at the same time. In fact, the acclaimed Atwater Kent Hour, a music program broadcast by the company featuring popular orchestral music, had one of the biggest audiences of the 1920s. In the early 1920s, breadboard radios were marketed to hobbyists looking to experiment with new technology. They were sold in inexpensive kits and meant to be assembled at home. By 1925, Atwater Kent radio sets ranged in price anywhere from $14 to $5,000. While the wealthier classes of Philadelphia owned enclosed and ornate radio sets by the mid-1920s, radio parts and wiring remained relatively inexpensive for working class families who wanted to build their own. 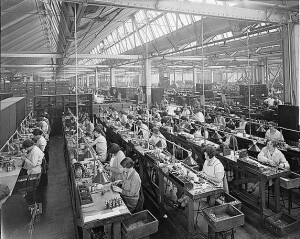 Factory workers of Fishtown could listen to the same news and music as the socialites of Rittenhouse Square. 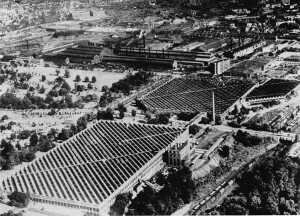 By 1925, the Atwater Kent Manufacturing Company was the largest maker of radios in America, employing 12,000 people in its Germantown factory. The company began to market enclosed sets, and in 1927, it offered AC-powered radios that ran on in-home electricity. Atwater Kent began manufacturing bigger and more elaborate receivers to keep up with consumer trends, until the stock market crashed in 1929. The Great Depression took its toll on Atwater Kent, and after six long years of declining sales, the company finally ceased operations in 1936. Although A. Atwater Kent relocated to Los Angeles, Calif., after the company’s dismantling, his legacy lived on in his commitment to the history of Philadelphia. In 1938, Kent purchased the former headquarters building of the Franklin Institute near Seventh and Market Streets for the purpose of creating a museum of Philadelphia’s history. Renamed the Philadelphia History Museum at the Atwater Kent in 2012, the museum amassed more than 100,000 objects related to Philadelphia’s social history, including this breadboard radio designed by its founder. Text by Chelsea Clarke Reed, jazz vocalist in the Philadelphia area and public history graduate student at Temple University’s Center for Public History.